Israel’s lobbies, led by AIPAC, are demanding absolute loyalty to Israel from all leading candidates. Israel’s lobbies do not care what voters know. The leading Democratic candidate in the March 20, 2018, primary, is J.B. Pritkzer, one of the nation’s richest men. The winner will face incumbent Republican Gov. Bruce Rauner in the 2018 general election. 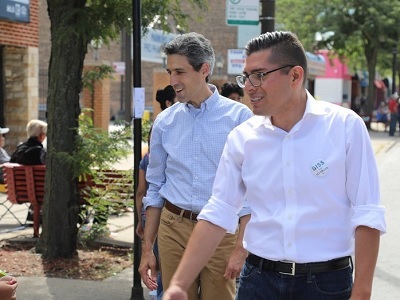 Running further down in the Democratic primary pack had been the team pictured above on the campaign trail, State Senator Daniel Biss (left), candidate for governor and Chicago Alderman Carlos Ramirez-Rosa, candidate for lt. governor. Biss and Ramirez-Rosa had been favored by the state’s Progressive voting bloc, until the split. As Robert Mueller and congressional committees dig into Russia’s role in the 2016 election, the Biss and Ramirez-Rosa progressive candidacy was smashed by Israel’s intervention in Illinois politics. What’s the difference between Russian and Israeli intervention? “Pressure from the Israel lobby has forced a promising progressive politician out of the 2018 Illinois governor’s race. “Only a week ago there was much grassroots excitement when Carlos Ramirez-Rosa, a member of Chicago’s city council, was named as the running mate of Democratic gubernatorial hopeful, State Senator Daniel Biss. “Ramirez-Rosa, who was a Bernie Sanders delegate during last year’s Democratic Party convention, is a member of the Democratic Socialists of America (DSA). “His selection was also a nod to the growing political role of Illinois’ Latino population; Ramirez-Rosa represents a diverse, majority Latino ward on Chicago’s northwest side. He has previously spoken about how experiencing discrimination as a gay person and a Latino has shaped his progressive politics. “DSA has seen a huge surge in membership since last year’s election, and just last month the socialist grassroots organization overwhelmingly endorsed the boycott, divestment and sanctions (BDS) campaign for Palestinian rights. Biss initially had made a smart move for his candidacy, when he reached into a Chicago Latino ward and made Ramirez-Rosa his running mate. But after some well-reviewed campaigning, a difference on BDS surfaced. Ramirez-Rosa revealed that his opposition to BDS was on the national level, not the state. AIPAC warned State Senator Biss, no wavering on BDS. For that “sin” of his running mate, Daniel Biss was forced to capitulate to Tel Aviv. Ramirez-Rosa withdrew his candidacy on a Facebook post which announced his departure from the Biss campaign. Ramirez-Rosa had to go. Biss knew what he had to do. He dumped his running mate. How exactly did Ramirez-Rosa go wrong ? Where will Illinois progressive go now? There are no leading candidates left who are willing to oppose the Lobby. On Friday, still hoping to keep his Progressive base, Biss tapped an African American woman, state representative Litesa Wallace, from Rockford, to replace Ramirez-Rosa. In Illinois, candidates for governor and lieutenant governor must run as a team. Currently leading in the race for governor, is Democrat J.B., Pritkzer, or J.B. as he calls himself in his already extensive TV ad campaign six months before the primary. J.B. did not have to be recruited or threatened into loyalty to Israel. He is well-established in the Pro-Israel camp. Pritzker’s philanthropic work is well known. It includes the Holocaust Museum and Education Center in Skokie. He led the capital campaign to build the center. The Pritzker family is one of the wealthiest in America. The family annually ranks near the top of Forbes magazine’s “America’s Richest Families” list. The family is well known for owning the Hyatt hotel chain. Pritzer’s sister, Penny, was a strong supporter of Barack Obama. She served in the President’s cabinet as Secretary of Commerce. The other major candidate in the Democratic primary is Chris Kennedy, the nephew of President John F. Kennedy. He played a key role in the 2014 firing of Steven Salaita by the University of Illinois over tweets critical of Israel’s attack on Gaza. Illinois is just one state. Nor did Biss pose much of a threat to Pritzer or Kennedy, both with backpacks crammed full with Israeli bona fides. Nevertheless, the Israeli lobbies takes no chances. No campaign is too small, nor too local, to assure that Israel’s control over American politics remains absolute. There is no question that AIPAC manipulates American foreign policy to give Israel carte blanche. Israel is a strategic ally of the USA and should be treated as such however I resent Zionist pressure to spend MY tax dollars to support THEIR state. I am mostly Polish. What kind of American would I be if I favored Poland over the interests of the USA? Has AIPAC no shame? I don’t think they do. 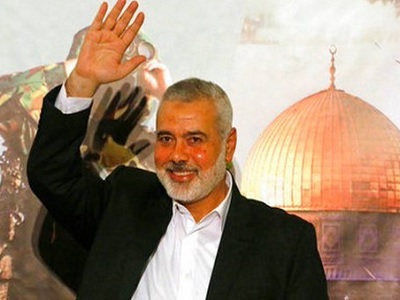 That said, Palestinians need to get the moral courage to 100% reject violence and stop supporting leaders who call for the destruction of Israel. Learn from Ghandi and Martin Luther King and even Mandela. Reject radicalism and gain a homeland.